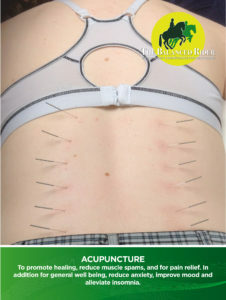 Acupuncture is the insertion of find needles into the skin and tissue to promote healing and pain-relief. It can be used in many ways along side physiotherapy to enhance the treatment. This could be to reduce muscle spasm, promote blood flow and healing, and reduce pain. It can also be used for general wellness, to reduce anxiety, improve mood, and to alleviate insomnia. Acupuncture at the Equine Rebalance Therapy Centre will be conducted by The Balanced Rider we are qualified and insured to use acupuncture in both a Traditional Chinese Medicine and Western Medical approach. Clare Howard undertook her Masters degree in acupuncture which ensures you are in experienced capable hands.